J&J Vinyl Fencing is Carson's best value for premium quality vinyl and aluminum fencing and gates. We offer a wide array of vinyl fencing and gate styles, in both privacy and semi-privacy designs, and all of our vinyl fencing products are backed by a lifetime warranty. In addition, we also design and install aluminum fencing, which serves as a more durable option to traditional wrought iron fencing. 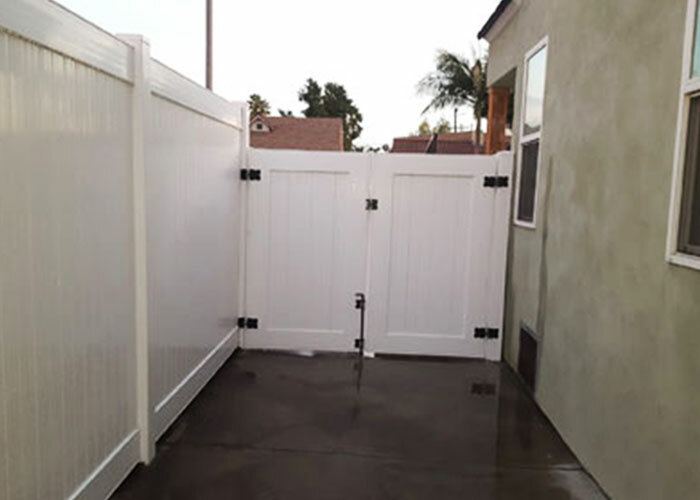 Our company was established in 1978, and since that time, we have provided our vinyl and aluminum fencing to thousands of home and business owners throughout Los Angeles County. We provide free onsite estimates throughout our service area, and offer a 10% discount to all first time customers. At J&J Vinyl Fencing, we work closely with our valued residential and commercial clients to design the ideal vinyl and aluminum fences and gates for their needs and design preferences. Our family-owned and operated company is dedicated to providing our clients with exceptional craftsmanship and excellent customer service, and for this reason, each of our fencing projects is personally supervised by our company's owner. Our skilled fencing craftsmen each possess an average of 15 years of experience in the fencing industry. They are committed to observing the highest standards of professionalism while on the jobsite at your Carson home or business, and take great pride in their work. Contact the vinyl fencing specialists at J&J Vinyl Fencing today, and discover how our durable, maintenance free vinyl or aluminum fencing can provide the perfect hardscape accent to your Carson home or commercial property. J&J Vinyl Fencing is licensed, bonded, and insured. Vinyl fencing is the ideal solution for property owners who would like a beautiful fencing system which is very low maintenance. 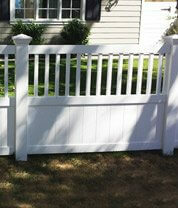 Vinyl fencing and gates are fabricated to have the appearance of wood fencing and gates, but none of the drawbacks. In contrast to wood fencing, vinyl fencing never requires painting, staining, or sealing, and is impervious to dry rot, cracking, splintering, and termites. Even after years of exposure to the elements, it maintains its like-new appearance. Moreover, it is available in both smooth and wood grain textures, and in a wide selection of both traditional and contemporary styles. Contact us today, to schedule a free estimate on a vinyl fencing system for your Carson home or business. J&J Fencing is licensed, bonded, and insured. Let J&J Vinyl Fencing create the perfect vinyl gate to enhance the architectural style of your Carson home or business property. 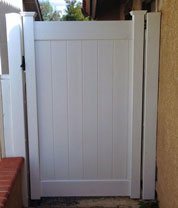 At J&J Vinyl Fencing, we are experts at creating unique vinyl gate designs, and offer our gates in both privacy and semi-privacy styles. Our vinyl gates are strongly constructed with a galvanized steel inner framework, and fabricated from the same high quality vinyl as our vinyl fencing. 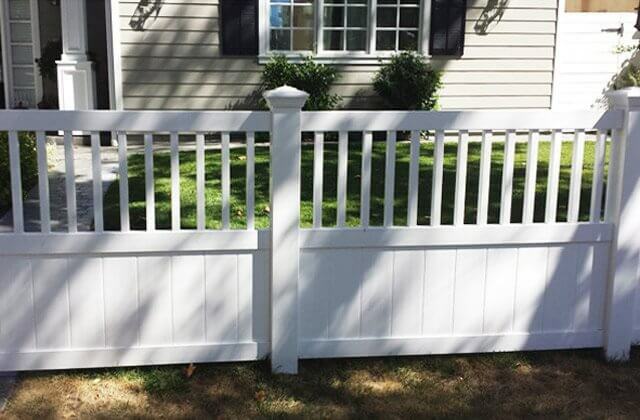 They are available in a choice of vinyl colors, and are equipped with premium quality gate hardware. Moreover, for those who would like their vinyl entry or access gate to open and close automatically, we can also outfit our gates with the latest in state of the art access control technology. 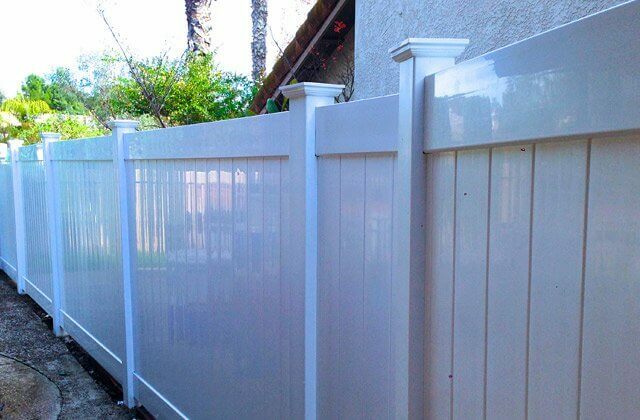 At J&J Vinyl Fencing, each of our vinyl fencing systems is designed and configured to conform to the individual design preferences of our valued Carson clients, and can be custom-crafted in a choice of colors and heights. Our vinyl privacy fences are constructed of high quality vinyl extrusions, and are backed by a lifetime warranty. They are ideal for enclosing yards and pools, delineating property lines, as well as for animal enclosures, and typically outlast their wood counterparts by decades. Vinyl semi-privacy fencing and gates can be designed in a variety of ways, by allowing varying degrees of space between the fence boards or rails, and also through the use of lattice panels. At J&J Vinyl Fencing, we offer our semi-privacy fencing in a choice of beautiful designs, colors, and fence heights, and with a choice of post cap options. We also install vinyl picket fencing for Carson homes and businesses. Picket fences serve the dual purpose of enclosing your commercial or residential property, while also providing your landscape with distinctive, traditional style. 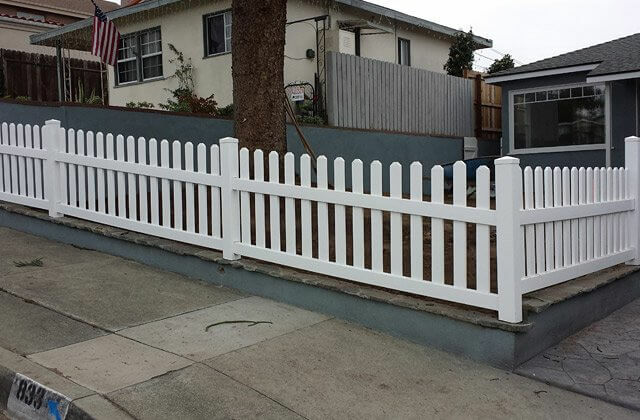 We offer them in both traditional and contemporary designs, and back our picket fence installations with a lifetime warranty. Ranch rail fencing is the ideal solution for enclosing livestock, and provides an effective barrier in many fencing situations without blocking a scenic view. At J&J Vinyl Fencing, we offer Carson many styles of ranch rail fences, in a choice of vinyl colors, including our cambium cedar, which looks like natural wood cedar fencing. 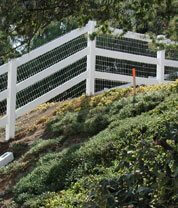 Our ranch rail fences are unsurpassed for structural integrity, and are virtually maintenance free. Contact us today. 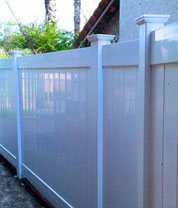 At J&J Vinyl Fencing, our skilled fencing craftsmen are also experts at designing and installing aluminum fencing. Aluminum fencing has the look and appeal of traditional wrought iron fencing without the maintenance concerns. Because it is not a ferric metal, like iron, it is far less chemically vulnerable to rust and corrosion. 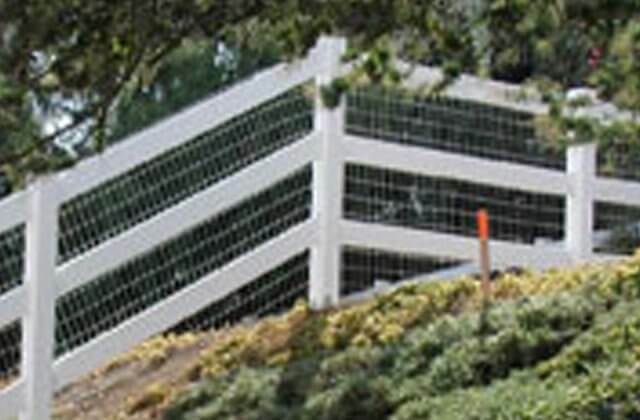 It is lightweight, yet extremely strong, providing a secure barrier around your Carson home or business property. And with the addition of spear-top pickets, proves to be an unscalable security fence. Aluminum fencing is perfect for delineating property lines, and enclosing residential and commercial properties and pools. In addition, it is the durable alternative to traditional wrought iron fencing in coastal areas where corrosive ocean air is a factor. Contact Carson's Best Value in Vinyl Fencing Today. Contact J&J Vinyl Fencing today, and schedule a free onsite design consultation and estimate at your Carson home or business. Our company has been serving Los Angeles County since 1978, and is licensed, bonded, and insured. We provide a 10% discount on our premium quality vinyl fencing and gates for first time customers, and accept Visa, Mastercard, American Express, Discover, cash, and checks. We utilize only premium quality vinyl and aluminum fencing materials, and back our vinyl and aluminum fences and gates with a lifetime warranty. 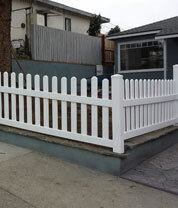 J&J Fence designed and installed this 7 ft. tall, white vinyl privacy fence for a Los Angeles residence. 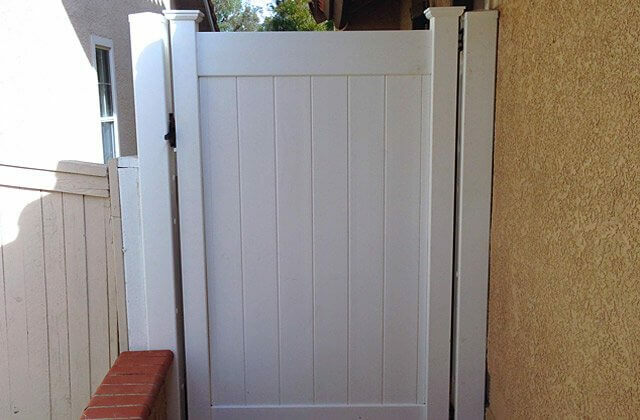 The attached double swing gate provides added security for their driveway entrance.